A young supporter of his local police department received a heartwarming birthday gift from them when they crashed his party, Lisa Boothe reported on The Five. 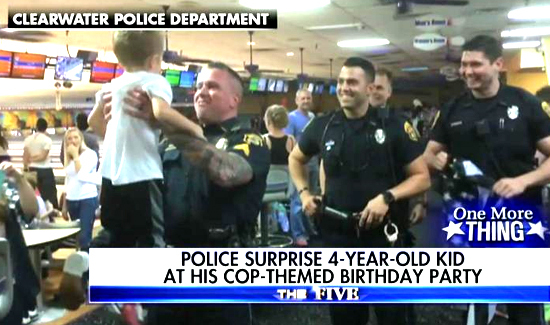 Brody Barnaky, 4, was celebrating his birthday at a Clearwater, Fla. bowling alley when four members of law enforcement stopped in and gifted him a Blue Lives Matter-style flag signed by each officer. Sergeant Tom Rodgers and Officers Justin Murray, Scott Pena and Tomislav Marjanovic came into the alley without Barnaky’s knowledge, and the boy immediately ran to the cops to greet them.